My studio is set up around 2 computers - my new intel macbook running OSX 10.5, which handles Live, Reason 4, Logic and Pro Tools 8 le and my trusty G3 PPC desktop running OMS on OS9. This setup is a great way to save money in your studio. All my Midi gear goes through two Opcode Studio 5LX's which I bought on E-Bay for less than a £100, and I love them. They're so flexible, there's absolutely nothing around currently to match what they can do for your midi equipment in terms of patching, splitting and layering and OMS is rock-solid. 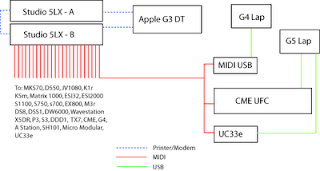 With this set up I can have 30 independent pieces of midi equipment each with their own 16 channels - how much would that cost in 8 channel USB units? I'm using Logic 5 and Opcodes Vision on the G3 which are perfect for Midi. Vision can be picked up for FREE from this site. I also got hold of Pro-Tools le 5.1.1 and a Digi 001 rack for peanuts, again, on E-Bay. So thats giving me 8 channel in/out audio recording onto a spare 9gig scsi drive, plus - another Midi in/out port and even though it doesn't have all the features of the new PT8, Pro-Tools 5 is pretty sweet at recording and editing. Now, even though all my gear is hooked up to OS9/Opcode gear I can still access it with my USB Midi equipment - all I have to do is send a midi cable from my UC33e, UCF or MidiSport and use a patch in my Studio 5's to access a multi patch of midi equipment - whether I need 16 channels of Samplers and 16 channels of synths, all running from Logic 8 or Live 7.